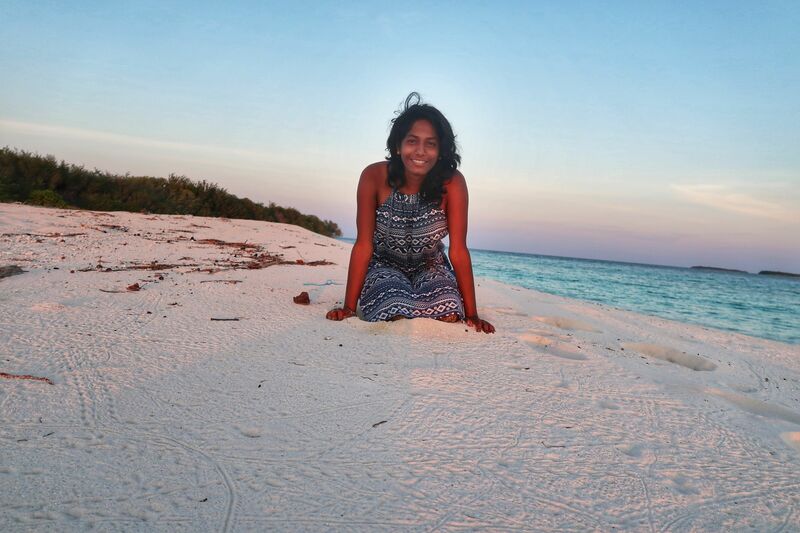 While i write this Blog post, I am here in this beautiful country of Maldives, enjoying the white sandy beaches, sunshine and crystal clear turquoise waters…! So earlier this Month in March, I quit my job to travel around the world. I choose to work as a crew in a small sail boat in exchange for free transport and food. A little backstory of how i got introduced to sailing….! Last year while i was in Indonesia, I met a group of young people travelling around the world in sail boats and busking with their art performances in the countries they arrive to make money for their next destination and living a fun filled and adventurous lifestyle exploring the remote places on earth. I thought it was amazing, and it sparked interest in me. I searched and found a sail boat from https://www.findacrew.net/. I arrived to Kochi’s Marina to join the sail boat. I stayed in the boat for almost a week before we set to sail to get used to living in the boat and get acclimatized to Sea. Before we set to sail, we did some provisioning for food, and filled up boat with Water and diesel, and got some small repairs done. and on the last day we headed to Immigration office to get our passports stamped. 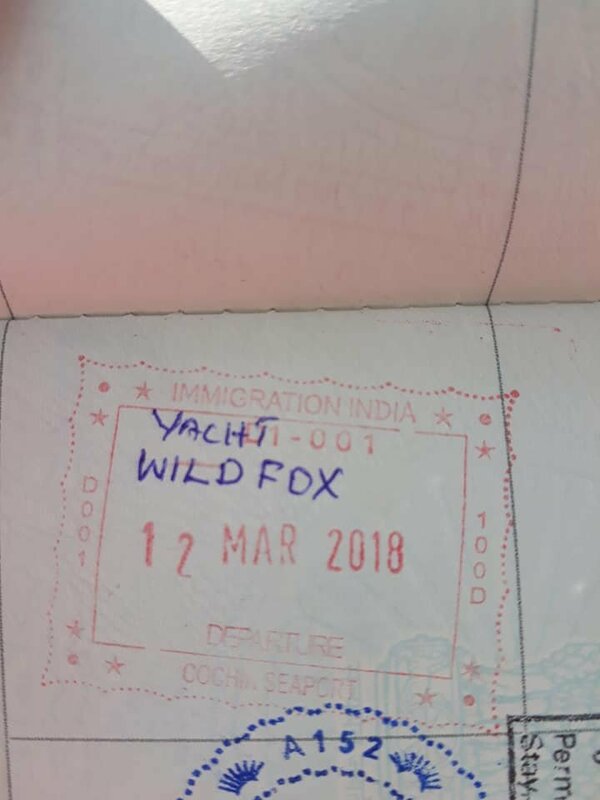 I had a very interesting experience with the immigration officers, They asked me many questions for about 30 minutes, they are quite surprised that an Indian girl is embarking on this expedition. They even asked if i had informed my parents about this or should they make a call to my family?? (LOL i am 25 years old, and they want to call my family…!!??? ), They asked how was i able to afford so much travelling?? (running through my passport pages and seeing the stamps). They are also concerned about my safety, that i am travelling alone with 60+ years old British man. They also made me write an undertaking letter saying that i was warned about all the risks and i am solely responsible if something happens to me and then stamped my passport…!! we are set to sail. We started the journey next day early in the morning. Not even 15 minutes passed that we left Marina, I started feeling Sea sick. I have never sailed before, so i did not know if i was sea sick. Sea sickness tablets should be taken before you start the journey and they make you drowsy. I did not take any tablets cause i did not want those side effects of the tablets and i do not know if i was sea sick. Not even 15 minutes passes that we started to sail, i started puking. so when you are sea sick, you basically cannot do anything inside the boat cause it will make you puke. All i could do was sit on the deck watching the horizon or sleep inside the boat waiting for my body to get used to the rocking of the boat. The distance from Kochi to Maldives(Uligan) was about 290 Nautical Miles and the captain estimated that it should take less than 3 days for us to reach Maldives. Despite the terrible seasickness, i constantly assured myself that it will be okay and i will get over my seasickness and at the worst i would be without food and water for 3 days. First day went alright. I was just sleeping all day and spent sometime on the deck watching the Horizon. The only times there was smile on my face was when i saw dolphins and flying fish having fun..! The second day is when the misery started, the currents in the ocean are not as expected and they were pushing us away from our destination and there is absolutely no wind. we had to Motor and we are moving at a speed of 5.5nm per hour but because the current is pushing us away at 3.5nm we are only making 2nm per hour…! Imagine moving at such a slow speed and not able to eat or drink anything, feeling weak and all sweaty having to bear with the engine running next to you while your sleeping all the time and having to hold on to something so that you don’t fall off your bed(The boat only had one cabin so i had to sleep on a small sofa). It was horrible….. I had nightmares on the 2nd day and seriously considered leaving the boat as soon as i see the land. All you can see is sea in all directions…. Here is a short video from the passage. The less than 3 day journey turned out to be a 5 day journey. I did not eat or drink anything except for a banana until the 3rd day, but on the 4th day the ocean was a little calm and i was recovering from the sickness and i was able to eat 2 eggs and drink some good amount of water. I started feeling better and that night i was able to see beautiful plankton, it was surreal to be able to see those shiny things glowing in the pitch dark night..! It made me feel light and happy and i started to enjoy the boat. On the fifth days morning, i got a sneak peak of the land…! i just sat on the deck watching the boat get closer and closer towards the land. My legs were eager to walk on the land again…! I cannot describe how happy i felt to see the beautiful Maldives and finally to be able to walk on the land.